Whenever I go to Chipotle I go with the intention of getting a burrito bowl with carnitas. I say “the intention” because recently, there has been a crazy carnitas shortage due to problems with Chipotle’s pork supply and locations across the country haven’t been able to offer it at all. While having to get one of Chipotle’s other delicious options isn’t the end of the world, it does make me crave carnitas! Braised and shredded carnitas before browning. After a little research on the Chipotle website I discovered that they flavor there carnitas, typically meat that is braised and then crisped, with juniper berry, bay leaves, and thyme. I kept it simple, only adding seasoning and some garlic, and was wowed by the result. This recipe takes a while, about 4 hrs of cooking time total, but you can always opt to do it in a slow cooker instead of the oven so you can go about your day while the pork does it’s thing. If you do decide to use a slow cooker, remember to ask your butcher to cut the pork shoulder into chunks so it fits in the pot. Mine BARELY fit and I wish I’d been able to add more water so getting it cut is always a good option if your butcher is able to do it. Browned pork shoulder before braising. 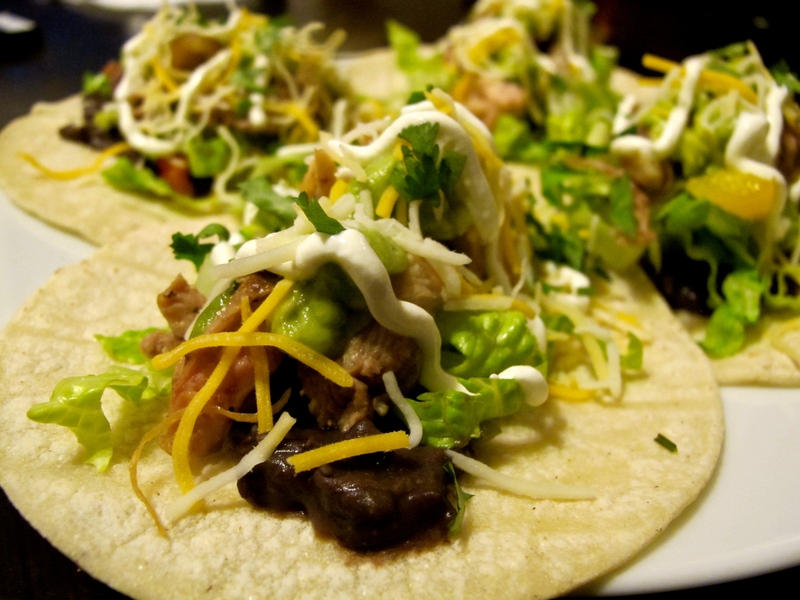 Pork carnitas tacos with homemade black refried beans, carnitas, guacamole, lettuce, cheese, sour cream, and cilantro on warm corn tortillas. Season and brown pork shoulder on all sides in a braising pan, flip fat side up, fill pan up with water until meat is 1/2 of the way covered. Note: My dish was too shallow to put as much water as I wanted, but it should be deeper if you can! Add garlic, juniper berries, and bay leaves to the water. Cook at at 300F for 4-5 hours or in a slowcooker for 6 hrs on low, basting every hour or so. Remove meat from pan, retaining braising liquid in a container, and shred meat with 2 forks. Note: You can reduce this liquid to make a sauce! Return shredded meat to the pan and broil on high until there are lots of brown and crispy bits! Serve in burritos, in tacos, on nachos, or wherever else makes you happy!